This nest of tables is a great addition to our Lila Range. 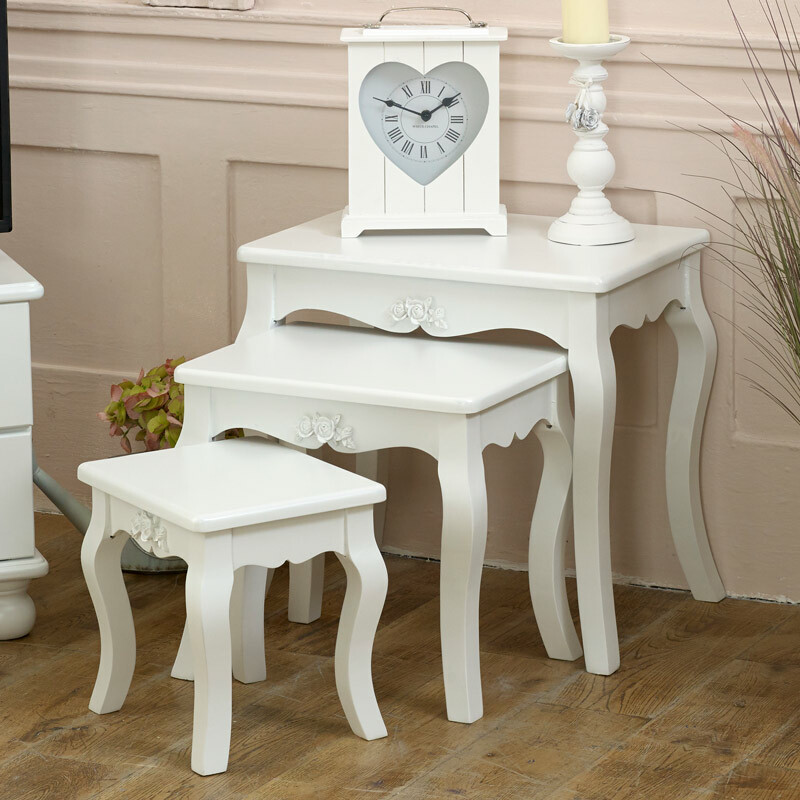 Beautiful French style in a white painted finish that will easily fit in with any colour scheme and add some vintage inspiration to the living room. In a set of 3, these are the perfect side tables for placing in the living room. Each table comes in a different size with the 2 smaller tables nestling comfortably inside the larger tables. Featuring rose carved detailing that complements this range beautifully. Used as a set or placed individually these are a wonderful idea for the living room or hallway. A great way to display floral arrangements or ornaments as well as adding extra surface space. This nest of tables is a great addition to our Lila Range. 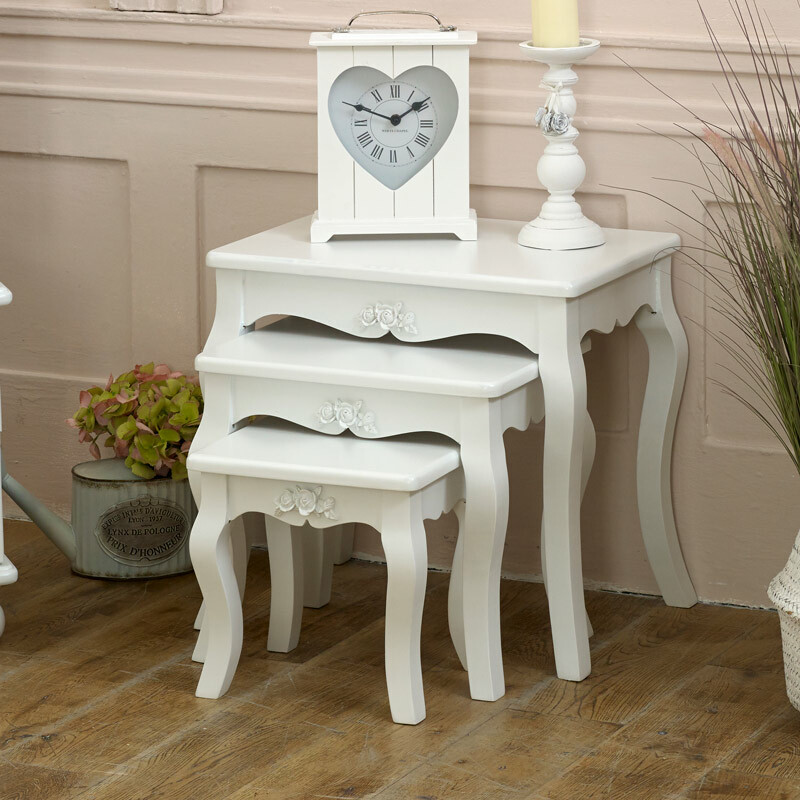 Beautiful French style in a white painted finish that will easily fit in with any colour scheme and add some vintage inspiration to the living room. In a set of 3, these are the perfect side tables for placing in the living room. Each table comes in a different size with the 2 smaller tables nestling comfortably inside the larger tables. Featuring rose carved detailing that complements this range beautifully. Used as a set or placed individually these are a wonderful idea for the living room or hallway. A great way to display floral arrangements or ornaments as well as adding extra surface space. Made from wood and painted in white satin finish. Each table comes fully assembled. Featuring a great selection of furniture in our Lila Range, we can help you to create the perfect look for your bedroom, living room and hallway. 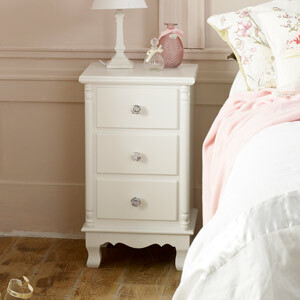 A white nest of tables from the Flore Range to suit country-style rooms and in useful sizes. It is a set of 3 tables, delivered fully assembled, perhaps useful as sofa or coffee tables. 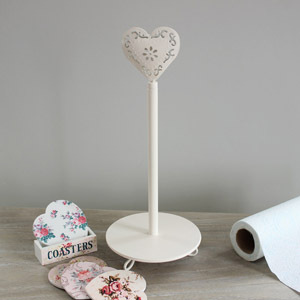 Each is made from wood with a white distressed painted finish and a wooden top that has a washed effect. There is an attractive, ornate carved roses detailing to the front of each table and the legs are shaped. The largest table is 54 cm x 48 cm x 35 cm (width x height x depth) with the middle one being 38 cm x 41 cm x 30 cm. The small table is 30 cm x 29 cm x 25 cm. There are complementary pieces in the Flore Range to add to your room's look.